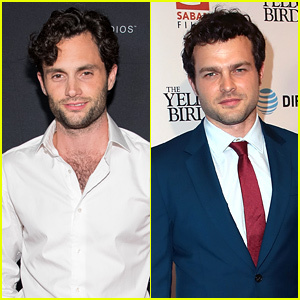 Ian Harding Photos, News, and Videos | Just Jared Jr.
Shay Mitchell is hitting the big screen this weekend in the new movie The Possession of Hannah Grace and she hosted an influencer screening this week! 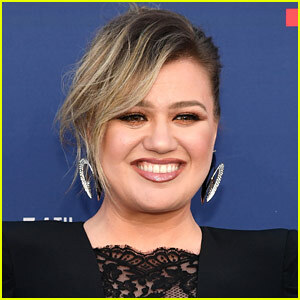 The 31-year-old actress was joined by her former Pretty Little Liars co-star Ian Harding at the event on Wednesday (November 28) at the ArcLight in Hollywood. Shay was also joined at the event by her Hannah Grace co-stars Grey Damon and Kirby Johnson. The new horror film hits theaters this weekend. 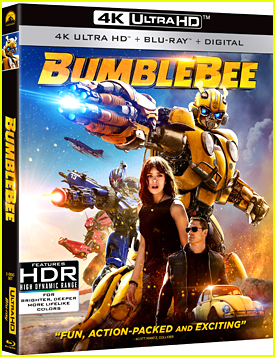 Here is the new movie’s synopsis: A shocking exorcism spirals out of control, claiming the life of a young woman. Months later, Megan Reed (Mitchell) is working the graveyard shift in the morgue when she takes delivery of a disfigured cadaver. Locked alone inside the basement corridors, Megan begins to experience horrifying visions and starts to suspect that the body may be possessed by a ruthless demonic force. Shay Mitchell and Ian Harding are spicing it up! 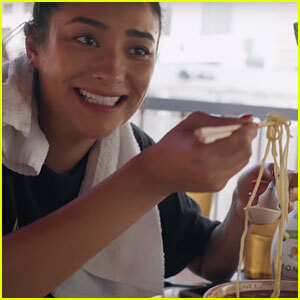 The former Pretty Little Liars couple teamed up to take the “Spicy Noodle Challenge” in a video Shay shared on her YouTube channel this week. The rules: They had 30 minutes to complete the challenge, they were allowed to drink as much as they wanted, no one was able to help them, and they weren’t allowed to go to the bathroom! Watch below to find out what happened! Ezria Lives! 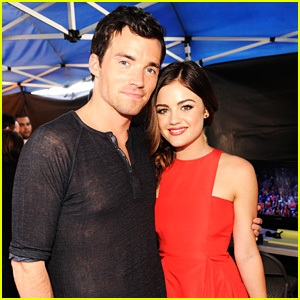 Lucy Hale Reunited With Ian Harding In Chicago This Weekend! Lucy Hale reunited with Ian Harding over the weekend and the pic is way too cute! The former Pretty Little Liars couple ran into each other in Chicago, Ill., and shared the reunion moment on Instagram. “Look who I found in Chicago,” Lucy captioned the pic on her Instagram. Just recently, Lucy opened up about what Ezria were mostly doing now, since the end of PLL. Traveling? Check! Tormented? Probably not. The ‘shh’ scene from Pretty Little Liars is pretty iconic and the cast are finally teaching us all how to master it. 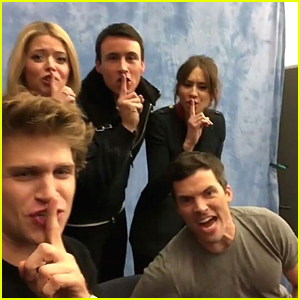 Keegan Allen gathered Troian Bellisario, Ian Harding, Sasha Pieterse, and Huw Collins together at the Revelations Endgame convention over the weekend to teach their fans just how to do the “shh” from the introduction, which ran all seven seasons. 'Pretty Little Liars' Cast Reunite at Revelations Endgame Con! The Pretty Little Liars cast is back together and ready to meet some of their biggest fans! 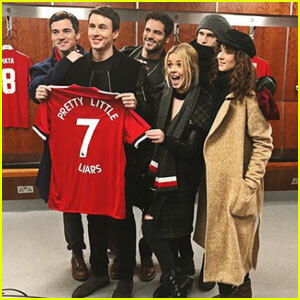 The cast – including Troian Bellisario, Keegan Allen, Ian Harding, Sasha Pieterse, Brant Daugherty and Huw Collins – all met up at the Revelations Endgame convention on Saturday (February 11) at Manchester Central in Manchester, England. 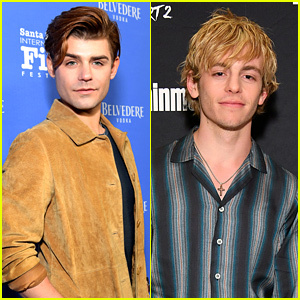 The cast all seem thrilled to be back together and took to social media to share some super sweet messages for the fans they met. “Thank you for making us feel very welcome Manchester ♥️ #huwsfavoritedayever #manchesterunited,” Sasha wrote. “My most sincere thank you to every single person who came to Revelations this weekend. It was amazing to meet all of you and to get to talk with you about the show. You made the event very special for us. I love you all,” Brant wrote. Over the weekend, the most epic party of all epic parties happened — with Ashley Benson, Troian Bellisario and Shay Mitchell! It was almost a full Pretty Little Liars reunion and JJJ is freaking out over it! The three ladies gathered together with former co-stars Ian Harding, Keegan Allen and Tyler Blackburn at a house for a full night of fun and games. It turns out that Troian is a master giant Jenga player, while Keegan, well, is not. Meanwhile, Ian likes to make a lot of funny faces for the camera while Ashley and Tyler gave us all the Haleb feels that we needed for 2018 (so far, anyway). Check out all the pics from the gathering below!